June 28, 2017 - Ontario Forest Industries Association (OFIA) member companies and forestry professionals know that the answer to that question is never. By responsibly harvesting less than 0.5% of our Crown trees annually, Ontario’s forest sector is able to generate real prosperity and support over 172,000 people in every region of the province. Ontario’s forestry community and their world-class, sustainable forest management practices, provide the only building material that is both renewable and recyclable, supporting communities and families, such as Habitat for Humanity partner families. 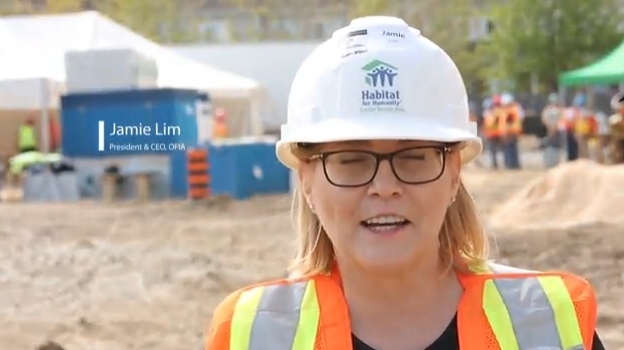 In honour of Canada’s 150th birthday and to celebrate Ontario’s sustainable forest products sector, OFIA partnered with Habitat for Humanity GTA as an Official Wood Sponsor at the Pinery Trail site in Toronto (140 Pinery Trail). OFIA’s forestry community, including Weston Forest, the Honourable Kathryn McGarry, Minister of Natural Resources, members of provincial and municipal government, Indigenous leaders and the Carpenters’ Union Local 27, rolled up their sleeves to help build 15 homes with Ontario Wood. “Building with wood is just as important to the members of our Union as it is to the forest sector,” explained Mike Yorke, President of Carpenters’ Union Local 27. To recognize the Ontario forest sector’s contribution to helping build Canada for over 150 years, and showcase its sustainable wood products, OFIA is proud to present a short video from the Pinery Trail build days.